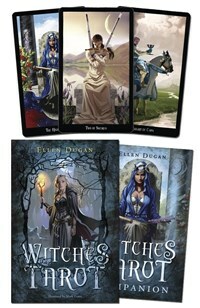 Ellen Dugan is the award-winning author of fifteen books, and is known as the "Garden Witch". A psychic-clairvoyant, she has been a practicing Witch for over thirty years. Well known for her candor and humor, she is a Master Gardener, and is the High Priestess of her Coven in the St. Louis area. Ellen teaches classes both online and across the country on Witchery, Psychic Protection, and Magick. She has contributed articles for over twelve years to Llewellyn's Magical Almanac, Witches Datebook, Sabbat Almanac, and Witches Calendar. Ellen's popular magickal books have been translated into over ten foreign languages. When she's not working on her next book project, or keeping up with her family (the kids are out on their own, and the youngest is in Graduate school), Ellen likes to unwind by working in her perennial gardens at home with her husband of 31 years. Ellen wholeheartedly encourages folks to reclaim their personal power and to personalize their Spell-craft. To go outside and connect with the spiritual side of nature. To get their hands dirty and discover the wonder and magick of natural world that surrounds them. Mark Evans (Queens, NY) is an award-winning artist who has created storyboards, concept designs, and production illustrations for hundreds of clients around the world, including Coca-Cola, Walt Disney, and Marvel Comics.